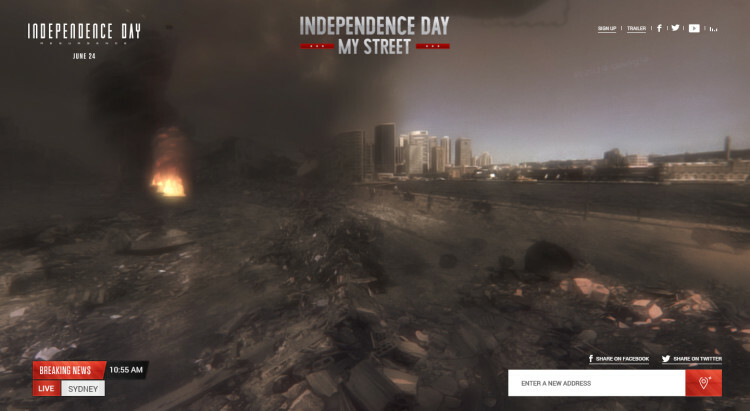 A new promotional website for the Twentieth Century Fox ‘Independence Day: Resurgence’ blockbuster lets you turn any street you like into the aftermath of apocalyptic alien attack. 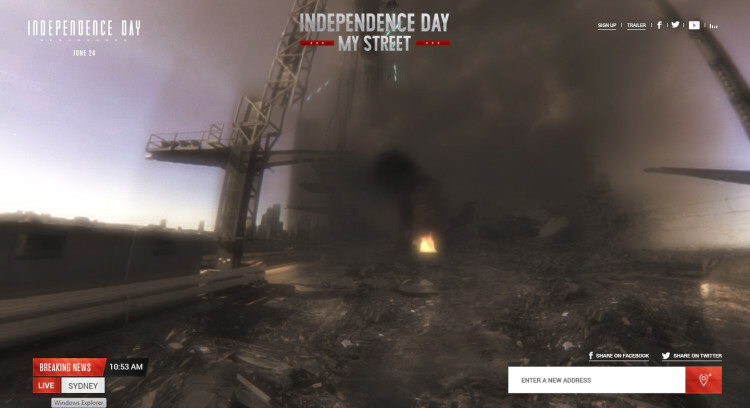 The interactive website, called “Independence Day: My Street,”, uses Google Street View-style images to essentially blast whichever street you type into the search box into a smouldering oblivion. And at first glance, it seems like a great way to promote the action-packed flick in an interactive manner, until someone pointed out that sites targeted by past terrorist attacks weren’t excluded from the locations you could search. The World Trade Center, site of America’s worst ever terrorist attack, as well as the Café Bonne Bière, site of the 2015 Paris terrorist attacks, and Brussels Airport, site of suicide bombings just this year, are all available to search, leaving scarily familiar visuals to those already witnessed during the attacks. While the depicted images do vary with the inclusions of aliens and spaceships, the overwhelming scenes of smoke, ash and rubble would be familiar to too many people around the world. Some locations have been blocked however, including La Guardia Airport and Pulse Nightclub in Orlando, Fla., where 49 people were shot and killed on June 12.